NYCFC goalkeeper Sean Johnson was out with a shoulder injury, so Brad Stuver made his first start for the club. Vancouver got on the board in the 22nd minute, as Nicolas Mezquida scored off a feed from ex-Red Bull Felipe. NYCFC got plenty of chances throughout the first half, as they poured in 13 shots, and they were rewarded in the final stages. Jesus Medina, on a feed from Anton Tinnerholm and Ismael Tajouri-Shradi, tied it for NYCFC in the first minute of extra time in the first half to send the game into the half tied at 1. This was Medina's sixth goal of the season, and fourth in his last five games. It didn't take long for NYCFC to strike again in the second half, as Jo Inge Berget came down the left side and fired a cross to the center of the box, where Valentin Castellanos buried it to make it 2-1. 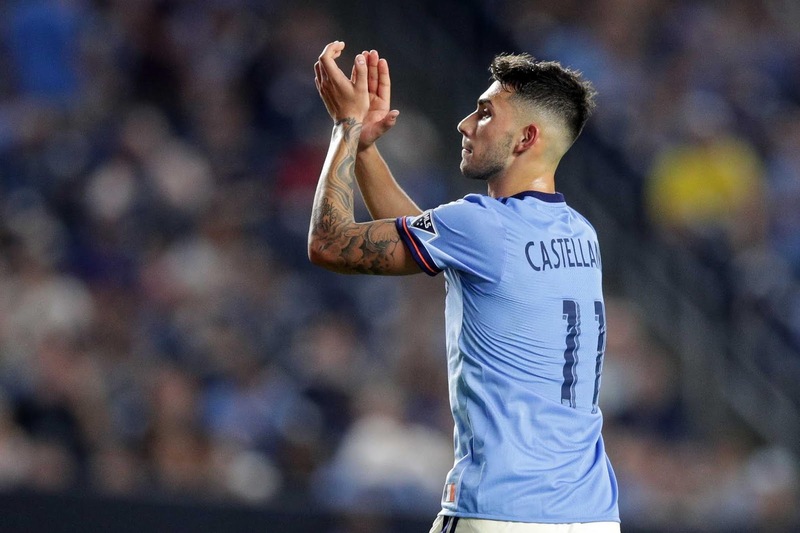 This was Castellanos' first goal for NYCFC in his very first game, as he was signed on July 27. NYCFC nearly doubled their lead in the 79th minute when Tajouri-Shradi sent one across the box, and Vancouver defender Aly Ghazal nearly kicked it into his own net. Vancouver was not done, and in the 87th minute, on a counterattack, Brek Shea and Russell Teiber found Erik Hurtado by the left post and he buried it to tie it at 2. In the 91st minute, Vancouver had a free kick from just above the box, and Shea nearly got the winning goal, as it slammed it off the crossbar. NYCFC, in second place in the Eastern Conference, is now 13-5-5, with 44 points. They are four points behind first place Atlanta (14-6-4, 48 points) and three points ahead of the Red Bulls (13-2-6, 41 points), who play Sunday night at home against Los Angeles FC. NYCFC was without their captain, David Villa, who was kept out of this one due to the MLS rule that states that a player who misses the All-Star Game is barred from their team's next game. That might be the dumbest rule in sports, as it is a very harsh punishment to ban a player from a real game for missing an exhibition game. This would be like Major League Baseball banning Aaron Judge of the Yankees for a week of games because he skipped the Home Run Derby. Villa missed NYCFC's prior six games, so he might not have played anyway, but it's hard to accept him being kept out because of such a backwards rule. If he were able to play, they would have had a better chance to win and from a business standpoint, might have drawn more than 20,802. They normally draw 25,000+ on Saturday nights.